Regardless of the precise meaning, we know the LTD crest has been used as submodel script on a variety of Ford’s vehicles over the years—including the ’70s-era Torino and the ’80s-era Taurus. But the car with which it is most properly affiliated was the automaker’s near-luxury large sedans that roamed the roads from 1965 through 1982. 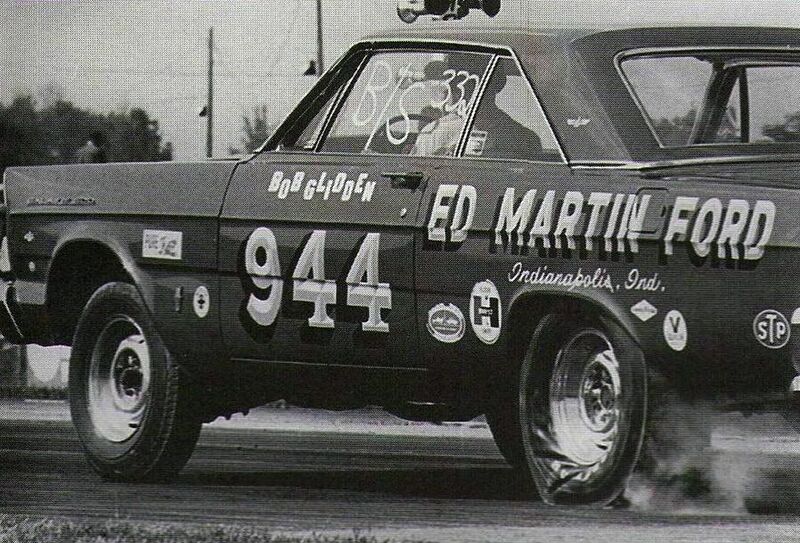 LTD began life as a high-trimmed Galaxie 500—riding on the same 119-inch wheelbase and displacing 3,578 lbs. It was about four inches longer, wheelbase-wise, than a same-year Fairlane 500—and about 600 pounds heavier. Base price was $3,313 and Ford sold close to 70,000 of them that first year out. The concept behind the LTD was to outdo Chevy (Caprice) as well as Dodge (Polara) and others who had glommed on to the idea of selling what amounted to working man’s Caddy’s—big cars with lots of upmarket amenities and a Family Guy price tag. Buyers could get their hands on power windows and door locks, air conditioning, 8-track stereos and a better cut of interior trim than was common on most of the Blue Light Specials of the era. The presence of at least eight-cylinders under the hood (vs. the depressing inline sixes found on the bottom feeders) was another clear point of departure. In its inaugural year, the LTD came standard with Ford’s highly-respected 289 cubic inch small-block V-8, in either two-barrel Lo Po (200 hp) or four-barrel Hi Po (271 hp) forms, the latter of which was essentially the same “K” engine used that year in the Mustang GT. Larger V-8s, including the powerhouse 390 and 427 big blocks—could be ordered optionally. Success was immediate and based on this, Ford spun off the LTD as separate model in its own right for 1967. It still shared a platform (chassis/frame and basic nuts and bolts) with the Galaxie 500 but had put some real distance between itself and that budget-minded big ‘un. The Galaxie notched down a peg and became Ford’s volume model (130,063 sedans were sold during ’67) while the LTD became Ford’s fanciest roller. Its base price of $3,298—which was about $600 higher than a base Galaxie sedan—reflected this. The ’67 LTD was a sharp-looking car, its front end defined by a pair of vertically stacked and forward-canted headlights set between a bar-type grille. There was a hint of T-Bird in the formal roof line—which naturally could be further pompadoured with vinyl topcoat. Sporty aluminum trim along the lower rocker panels and turbine-style wheel covers added flair. The trunk, meanwhile, was hot tub huge. With a few tubes of RTV to make it water-tight, you could either take a dip—or provide a home on-the-go for several sea bass. Inside were low-back, three-across bench seats, a 120-mph speedo (with “redline” beginning at 70, the-then typical highway speed limit) and a fuel gauge off to the left. These two instruments told you the two most important things to know about your new LTD: How fast? And: How much gas is left? Underneath the speedo was a secondary array of indicators for oil pressure, temperature and alternator (later models got idiot lights). The passenger-side glovebox area could be finished with handsome fake wood trim and the door panels boasted their own armrest—with individual ashtrays all around. Shoulder belts, however, were nowhere to be found. The Safety Nazis had not yet held their version of the Beer Hall Putsch—and LTD drivers were still free to drive without being strapped in like Apollo astronauts for each trip to the corner gas n’ go. Color choices included classics such as Light Tobacco Bronze—a choice of words that would surely arouse a frenzy of concerned mom letter-writing in these less happy times. In ’69, a major makeover added hidden headlights—as well as a few more pounds. Actually more like 400 pounds. An LTD sedan now bellied up to the bar at nearly 3,900 lbs. Wheelbase was extended to 121 inches, too—making the ’69 the longest and heaviest LTD to date. The quad headlights were no horizontally arranged and there was the hint of a beak in the tapered tip of the nosecone. Like an aging jock with man breasts where pecs once were, pendulous bumpers hung off the revised front end, which lost its headlight doors after 1970 (these would make a comeback, like Elvis, in subsequent years) but still had the colossal 429 V-8 under its hood, if the prospective buyer checked off that option. Otherwise, a 302-cubic-inch small block was standard. The look was more stolid—the veritable breadbox on wheels—which Ford can’t be blamed for as much as the government. Suffocating bumper-impact standards made it next to impossible to deviate from a basic shape that was more or less brick-like. Still, it was an impressive sight. In silver or light blue, all that seemed missing was the conning tower and a battery of 16-inch guns. There would have been ample room on the fantail to paint a helicopter landing pad—and with a few missile launch tubes along the flanks, an LTD would have been a fair facsimile of the USS Iowa during its first Gulf War sortie. Perhaps the best part about the mid-’70s LTD, though, was the availability of the second-biggest V-8 ever offered in an American car. 460 cubes were at your disposal. To get bigger—and thirstier—you had to step up to a Cadillac. In the Ford line, even Lincoln offered nothing larger. The 460’s single-digit appetite for regular unleaded is also something whose like we shall not see again. Another interesting thing about the 460 is it holds the distinction of being one of the least powerful huge engines ever made—barely cresting 200 hp in its final years of production. America’s Bicentennial Year was also the last year for a truly large LTD—and also the 460 V-8, which Ford simply could not bring forth any longer without risking a beating by the EPA. Despite the new reality, a decently redone LTD appeared in ’77 and this car soldiered on through ’82 with its standard V-8, rear-drive layout and boxy but accommodating bodywork unmolested. Legions were pressed into service as taxis and cop cars—where sturdy features such as a solid rear axle and the availability of both the 302 and 351 V-8s made it virtually indestructible as well as ideal for bouncing over curbs at 30 mph or idling in front of hotels and airports for hours on end, AC blasting away. In ’83, the curtain came down for good on the LTD when the almost-compact Fairmont sedan showed up—and the Crown Vic became Ford’s last-man-standing large sedan. 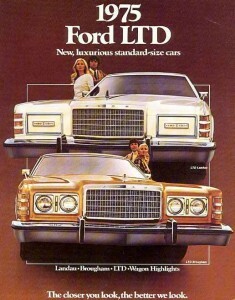 Ford continued to mount the LTD crest on various models and continues to do so to this day. But for the most part, these have been thin-blooded pretenders unworthy of the name. * A ’75 LTD with the 351 V-8 heaved itself to 60 in 13 seconds while slurping gas at the rate of 9.5 MPGs, according to the Road & Track 1974 New Car Preview. * In the first Terminator movie, Kyle Reese and Sarah Conner try to avoid Arnold in a blue LTD. Another apocalyptic LTD is featured in the 1971 Charleton Heston Classic, The Omega Man—during which Heston’s character machine-guns mutants from the front seat of a red LTD convertible. * The LTD Brougham was as close to a Lincoln Town car as you could get without actually ponying up for a Lincoln. Next articleSo Your Car’s A Lemon… What Can You Do? Why are these pieces of machinery so wonderful? 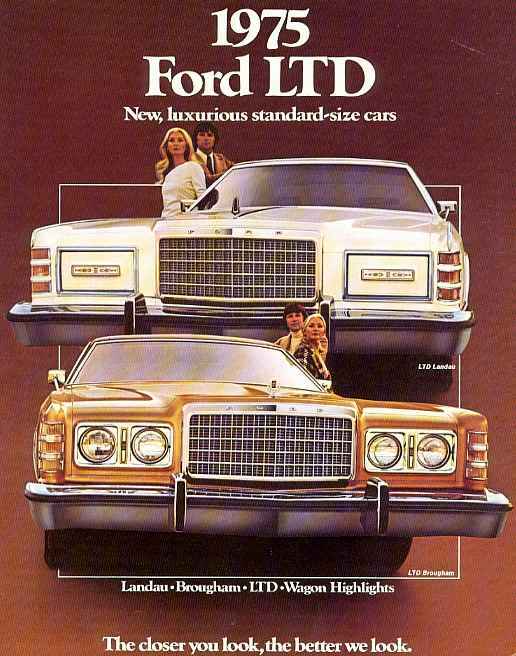 Actually, the 1973-sized LTD lasted until 1978. The downsized LTD began in the 1979 model year.